Not too long ago I was choosing the K Pentax digital camera as my first contact with the dSLR world. It was shortly put, love at first sight. Great ergonomics, very good build quality (especially for an entry level camera) , a tool that fit me and my needs. It just worked and did the job it was made for. I talk here about the K100d model, an entry level camera from Pentax launched in 2006 I think. It had more features than any other camera from the competition. In the same time I also switched from the screw mount (M42) system to the same K mount for film cameras too. I kept of course the M42 lenses. They can be used on the K mount cameras by using a mount adapter. So, combined with the only two AF Pentax lenses,I used other manual focus lenses picked up off ebay. At first I considered the film cameras a little too expensive while there were cheaper alternatives that used the same camera bayonet. 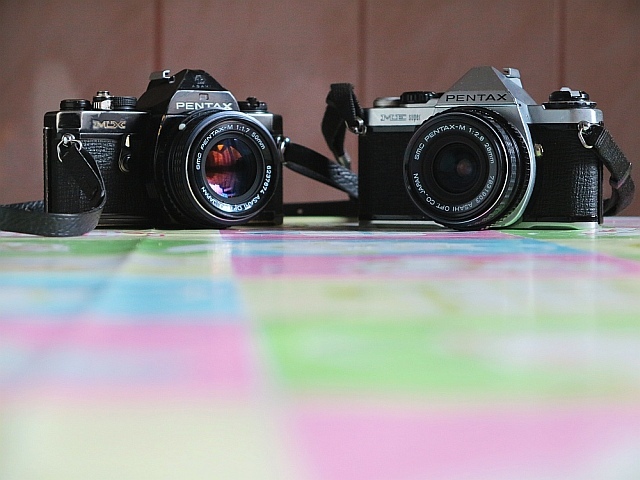 So, I went after the cheaper Ricoh (what irony that in these days Ricoh bought Pentax) , Chinon cameras and the P series from Pentax (probably the cheapest ones in the Pentax's manual focus cameras line up). - the viewfinder is just great, big , clear, bright and can compete with the one of the Minolta's X500/x700 model. - there are times when I miss the shutter speed dial on the ME Super but at least its speeds go till 1/2000 of a second. - both have mechanically controlled shutter speeds (all an the MX, and one, 1/125 on the ME) in case the batteries or the electronics die. - both use the LR-44/SR-44 (ag13) widelly found batteries that can last forever. - the cameras operation is smooth, the shutter sound is a pleasure to hear it and the whole photographic process is way more enjoyable. All in all if I think there is a camera that solves the minuses while keeping the pluses. And that's Pentax's flag ship model of the more or less same era and now my dream film camera: the LX, Pentax LX .